Hardy deciduous shrub or small tree up to 1-5m with aromatic palmate dark green leaves. In summer it bears butterfly attracting slender spikes of lilac, pale violet and white flowers followed by red-black fruits. It requires full sun or partial shade and well-drained soil. Chaste tree can take severely pruning in spring and faded flowers can be cut off to promote continuous flowering. Chaste berries are aromatic, have a peppery taste and can be used as a substitute for pepper. 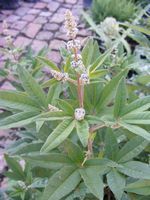 It is used in Middle Eastern spice mixtures. The dried peppercorn-sized fruit (seeds). It can be used in a tincture or herbal tea to relieve menstrual and menopausal complaints, normalize menstrual flow and to increase milk production in lactating mothers. Also increases the flow of urine, treats benign prostatic hyperplasia (BPH) and reduces sexual desire - hence the name "Monk's pepper". In early times monks chewed chaste tree parts to make it easier to maintain their celibacy. 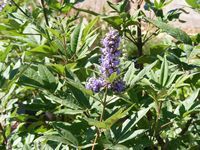 Vitex agnus-castus can be used for acne, nervousness, dementia, joint conditions, colds, upset stomach, spleen disorders, headaches, migraine, eye pain, body inflammation and swelling. Not to be taken by pregnant woman. The twigs/branches of the chaste tree are strong but very flexible, which enable them to be used for making baskets, ropes and even furniture.